Manchester City captain Vincent Kompany faces a fitness test ahead of Saturday’s Premier League game against Bournemouth, although the defender is more likely to be ready for the Christmas fixtures, manager Pep Guardiola said on Friday. 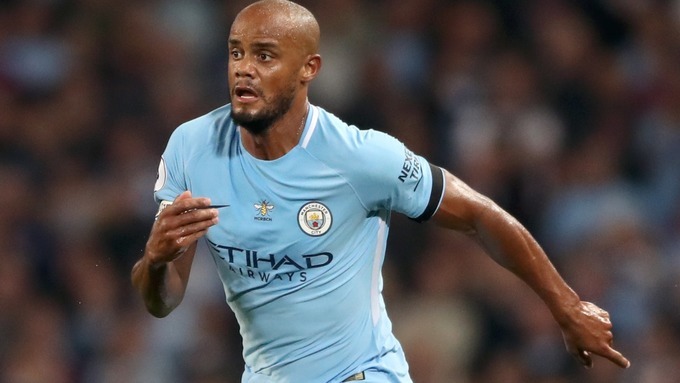 Kompany pulled up injured in City’s 2-1 victory over Manchester United on Dec. 10 and missed their next league games against bottom side Swansea City and Tottenham Hotspur. Guardiola, however, suggested the Belgian’s injury was not as serious as feared. Kompany’s fellow defender John Stones is closing in on a comeback from a hamstring injury that has kept him out of the last six league matches but the return of the senior defensive duo will not alter Guardiola’s January transfer plans. City have four senior centre backs in Stones, Kompany, Nicolas Otamendi and Eliaquim Mangala and the manager had earlier indicated he could be in the market for a defender as part of his long-term strategy. Teenager Phil Foden faces a spell on the sidelines after injuring ankle ligaments. The 17-year-old played a part in City’s 4-3 shootout win at Leicester City following a 1-1 draw after extra time in midweek. Bournemouth have their own injury issues ahead of the trip to the Etihad Stadium, with manager Eddie Howe confirming that striker Jermain Defoe (ankle) and defender Charlie Daniels (tendon problem) will miss the game. City’s 2-1 victory over Bournemouth in August was the first of their 16-game winning streak but Howe believes his 16th-placed team can end the leaders’ record-breaking run.